If you build 'em the food will come, and so will we. 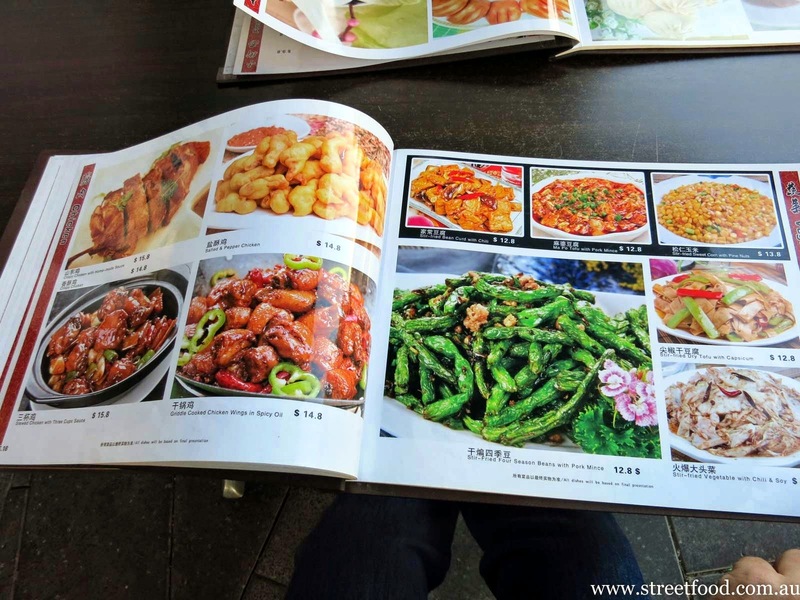 We poke our noses underneath the gleaming new towers in Waterloo to find some North Chinese food treasures. 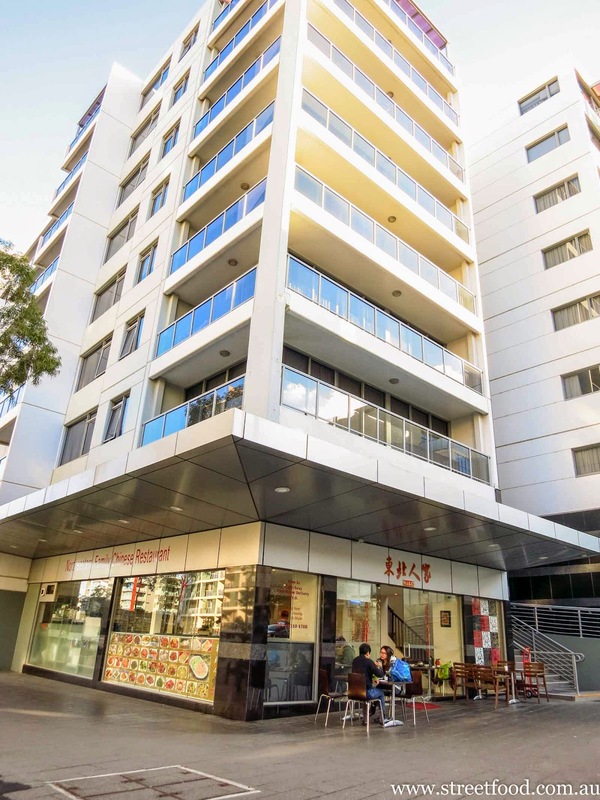 We've been exploring the newly redeveloped apartment areas around Waterloo and Zetland thinking there must be some good food in them thar highrises. We found a small vein of gold in Waterloo. 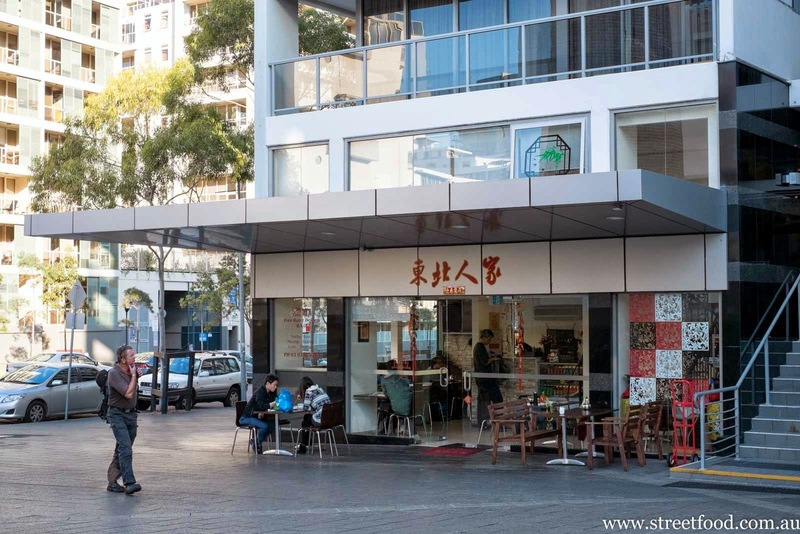 Our first pick has the English name of Northeastern Family Chinese Restaurant. 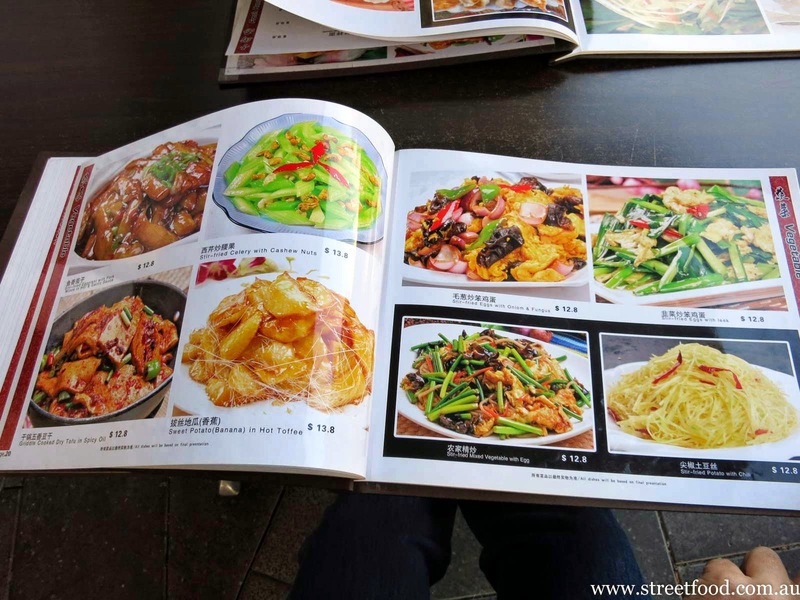 The cooking style is similar to the Northern style we are used to, but much sweeter with less chili and pepper, our palates were confused at times. Stupid palettes. 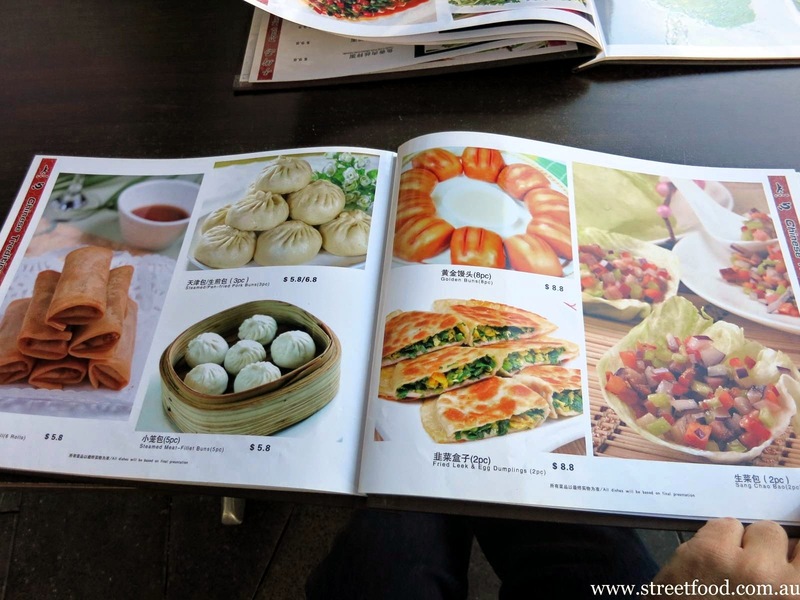 The easiest dishes to recommend are the dumplings and pancakes, the auntie out the back is a bit of a dough fiend, she does a mean handmade noodle as well. It's a busy little place. There's only a few tables so it fills up quick and they do a lot of takeaway as well. Watch for the guy zipping around Waterloo on his little electric bike with bags of boxed up deliveries, he drives right into the store when it's not too crowded to get his next order. The blue plastic car works as a low rent kiddie activity centre, the little buggers love it. That thing beeps and revs and flashes. You were warned. 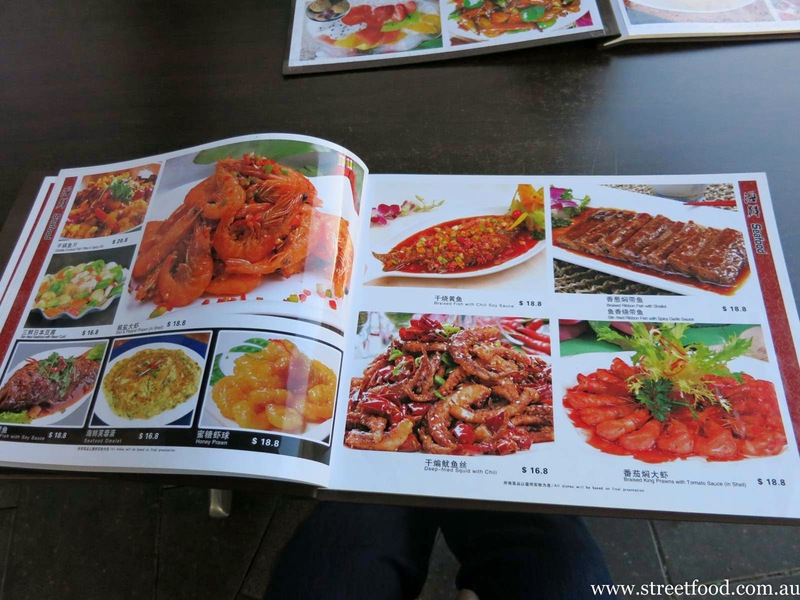 There are a number of snacks or side dishes on the menu. 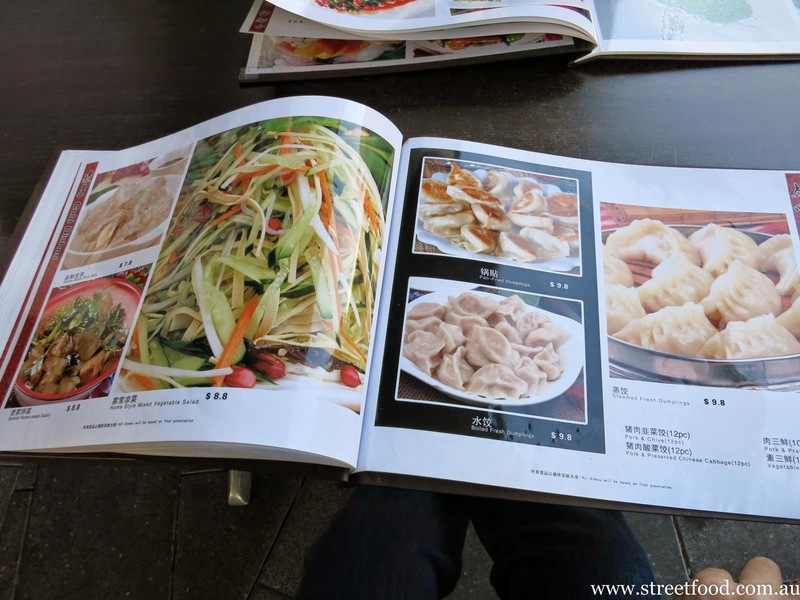 Preserved egg with cold beancurd - $7.80. 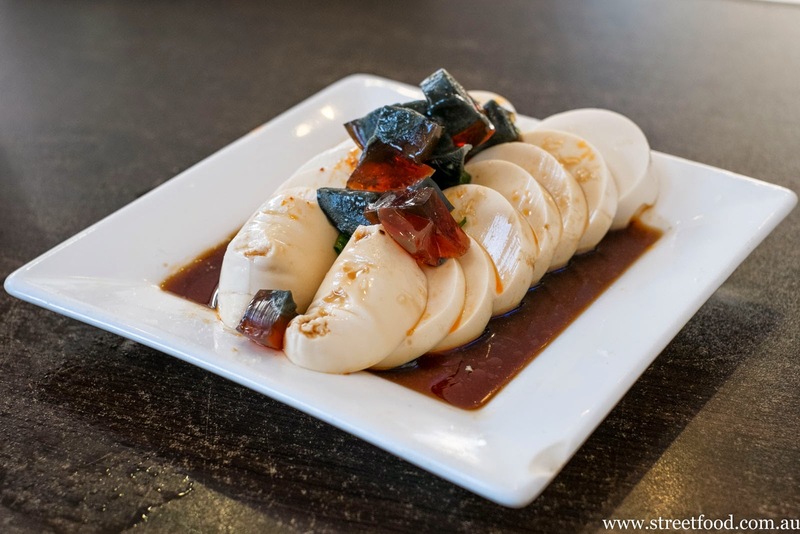 The classic dish of cold soft tofu with century egg. The plain tofu against the uber salty egg is yet another wonder of Chinese cuisine. The soy and sesame based sauce adds another salty flavour layer. Fried leek and egg dumpling - $8.80. Fried leek and egg dumpling innards. 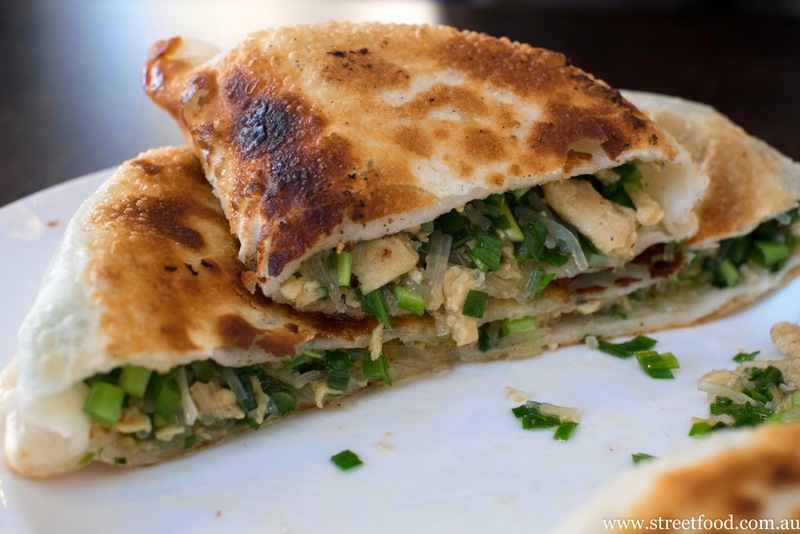 Chopped Chinese garlic chives, scrambled egg and some vermicelli filler inside a fried bread crust. Northeastern style cold noodle - $9.80. 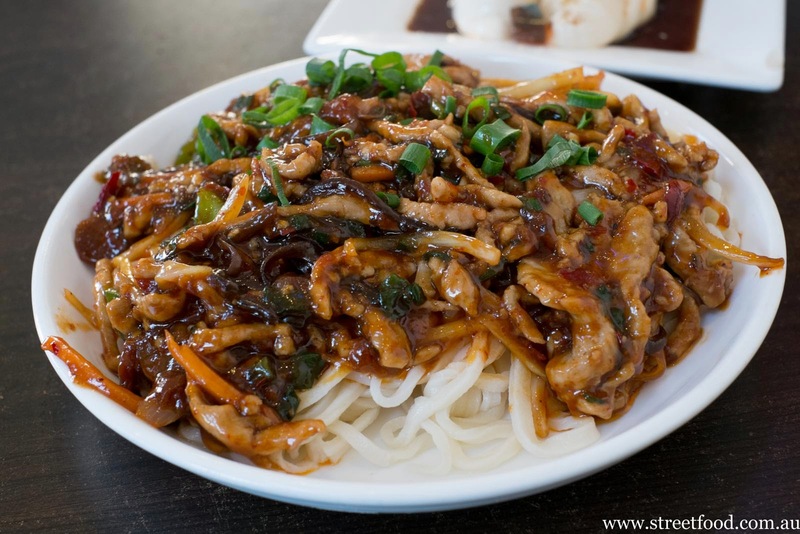 Cool handmade noodles with warm pork sauce on top. 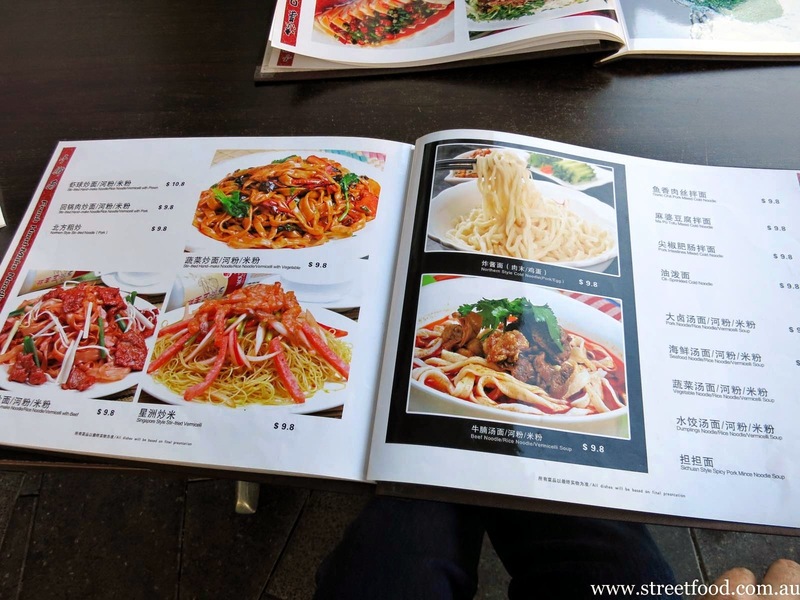 The sauce was sweeter than and less spicy than we expected, great noodles though. 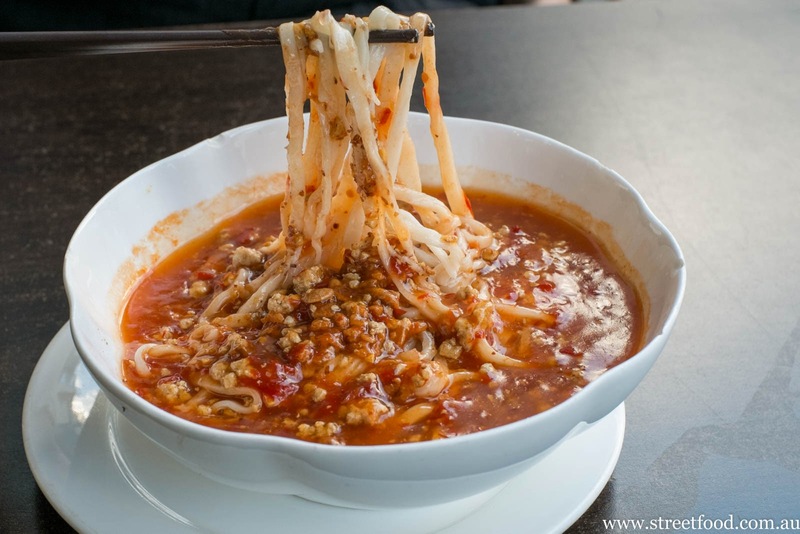 Sichuan style spicy pork mince noodle soup - $9.80. 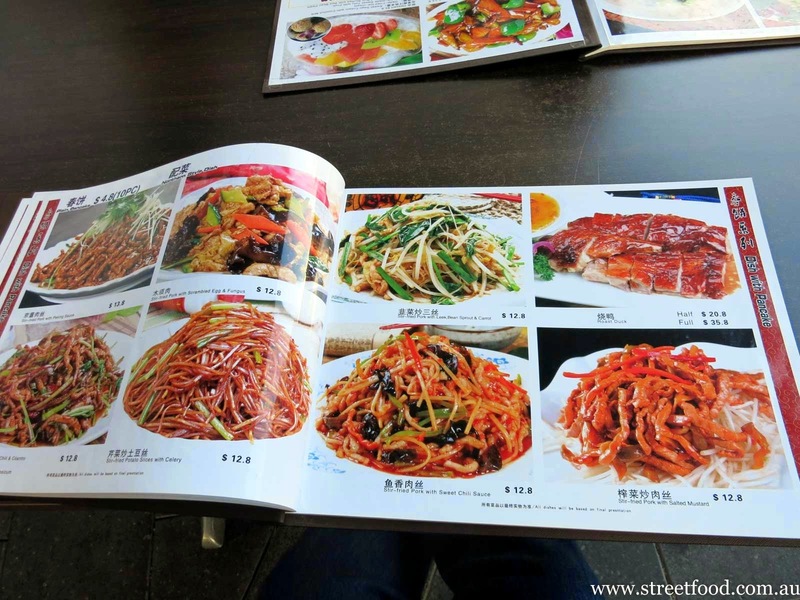 A large serve of handmade noodles in a tomato-y, porky gravy that again was sweeter and less spicy than expected. The chilli flavour came from a vinegary pickled pepper instead of a dried and fried kind, adding to the sweeter over warmer chilli flavour. 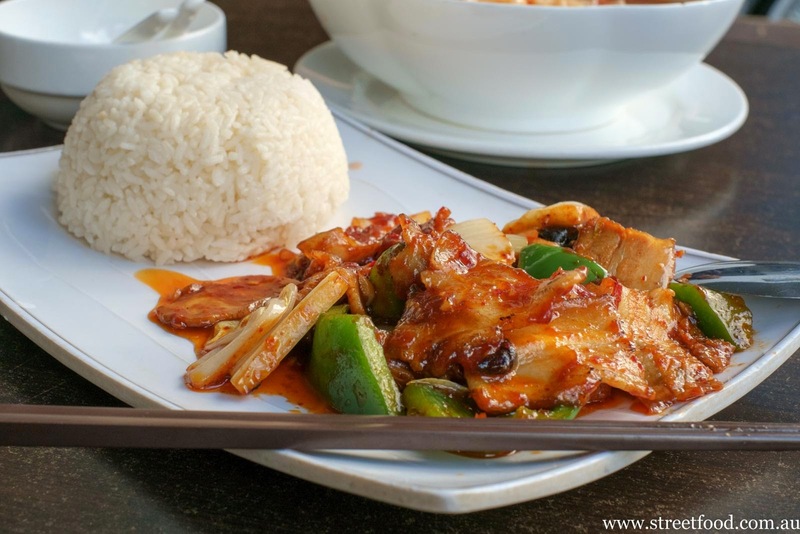 The $9.90 lunch specials are a good deal, such as this double cooked sliced pork in spicy sauce and rice. 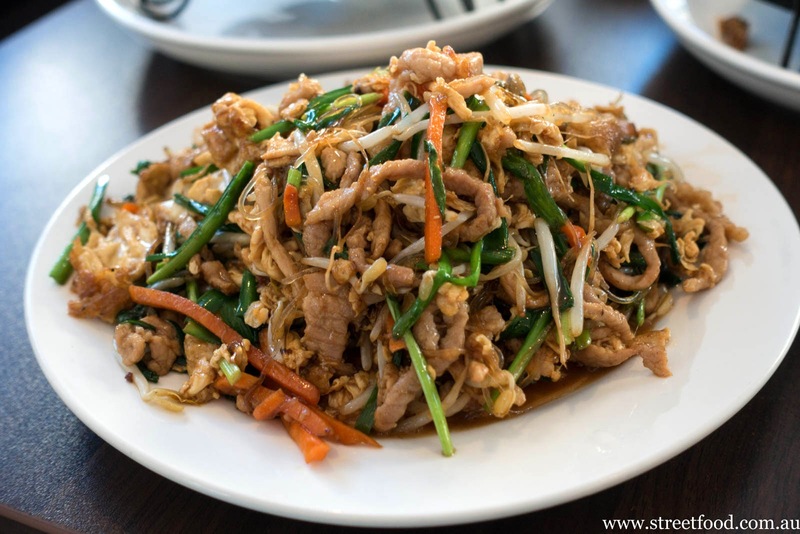 Thin slices of probably roasted pork stir fried with some veggies and a little spice. Ringadingding. 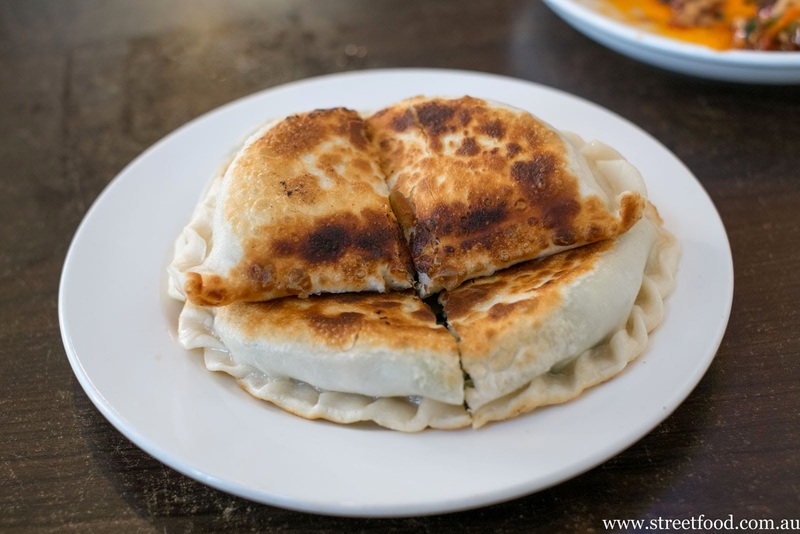 Steamed meat filled buns - $5.80. 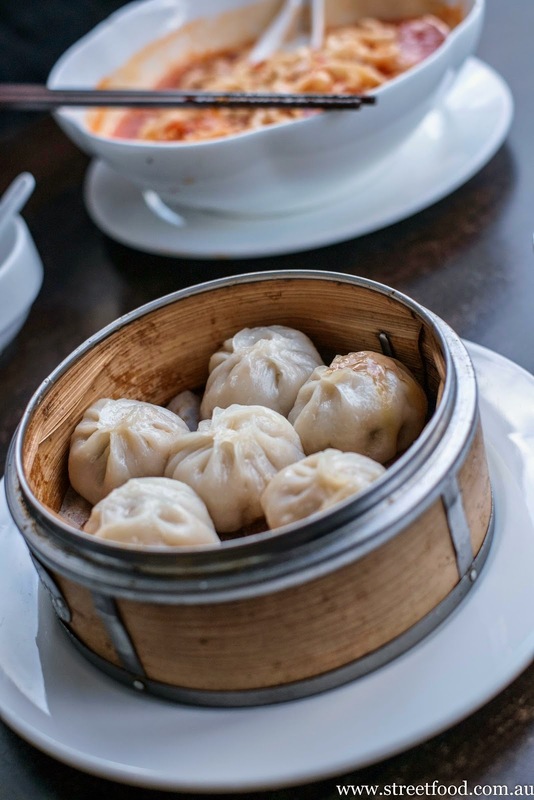 We're generally dumpling agnostic but these were little beauties - simple steamed pork(?) dumplings jazzed up northern style with some spice, cumin and turmeric we guess, the dumpling meat had a golden colour from the spices used. We'd order these again in a flash. Stir fried pork with leek, bean sprouts and carrot, $12.80. A home style dish that also had a generous amount of scrambled egg in it as well. We loved the basic flavour of the vegetables mixed in with finely sliced pork fillet, with the egg giving it a comfort food quality. 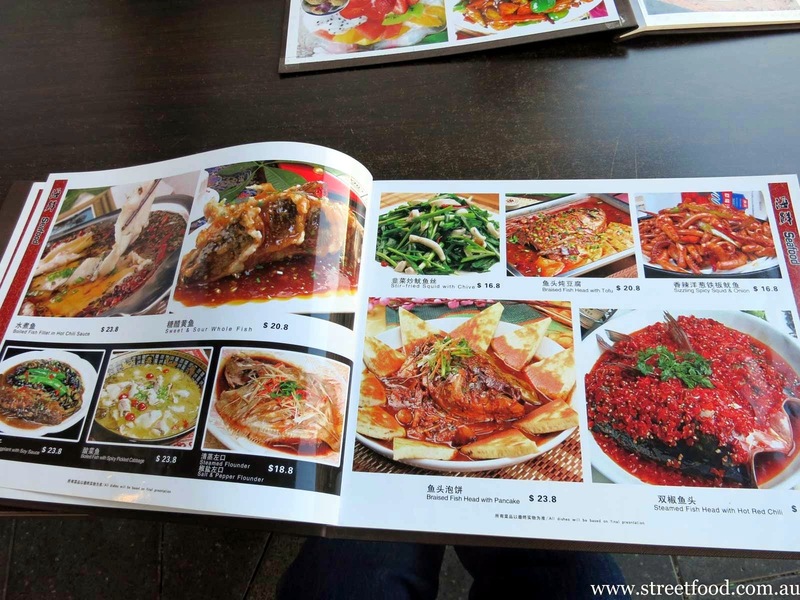 From the very first pages of the expansive menu comes the Northern Style Combination Braised Pot. 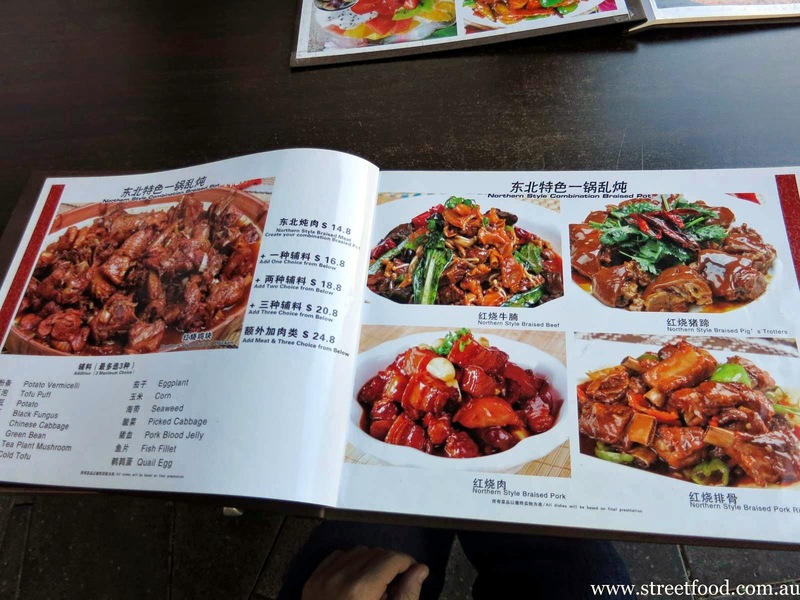 The chicken version comes with rough chopped pieces with bones and skin, be prepared to be spitting out fragments of bone. 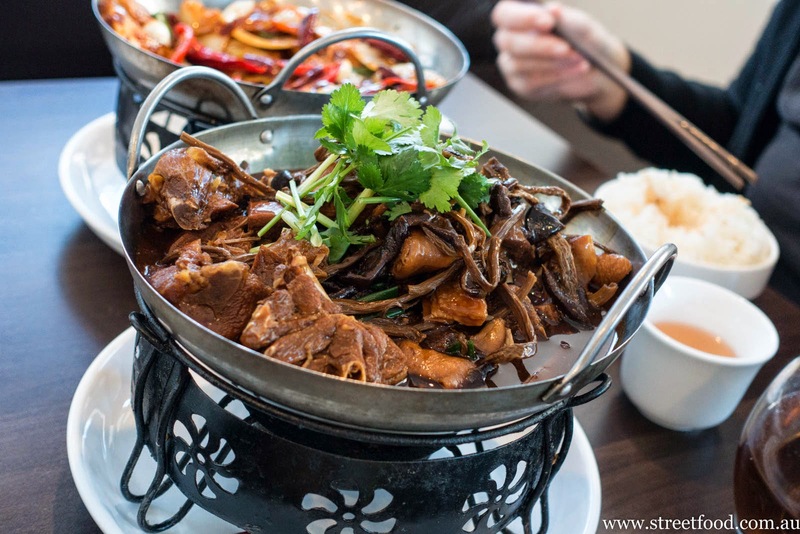 You can order a basic meat version or add in up to three extras, we chose tea tree mushrooms which worked in well with the star anise flavoured broth. $14.80, add $2 for the extra mushrooms. Griddle cooked dry tofu in spicy oil $12.80. 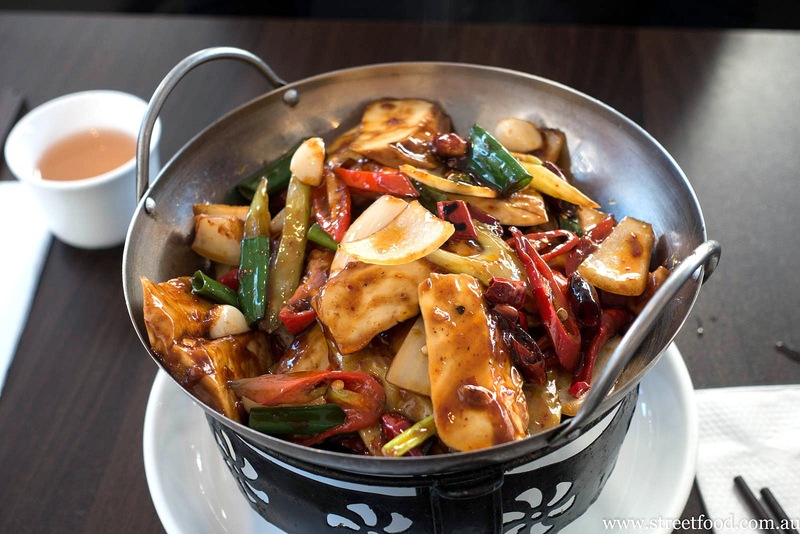 A hard pressed tofu stir fried with onions, fresh chillis, dried chillis, leeks and chunks of garlic. The chillis didn't overpower the dish but gave a great balance, and this dish didn't have the heavy hand of sugar either. We loved the hunks of garlic, lightly cooked and fought over when they appeared in the mix. 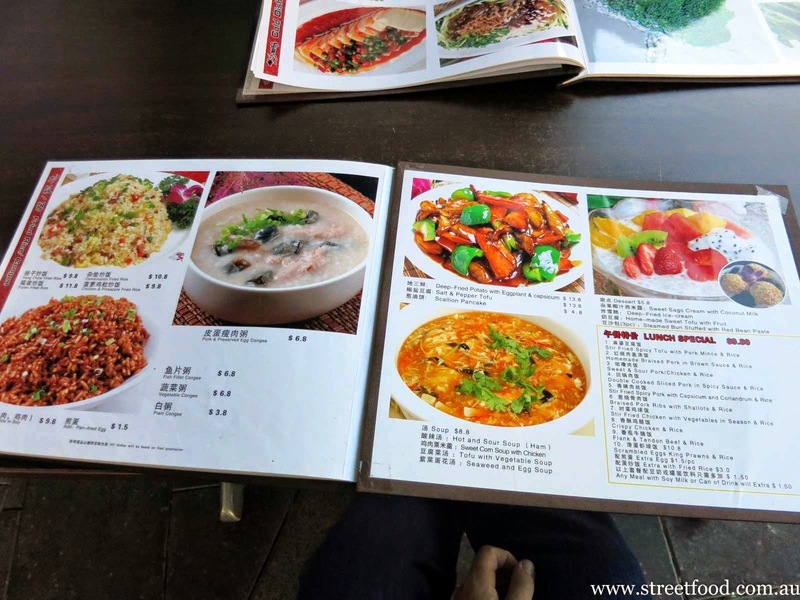 Northeastern Family Chinese Restaurant. 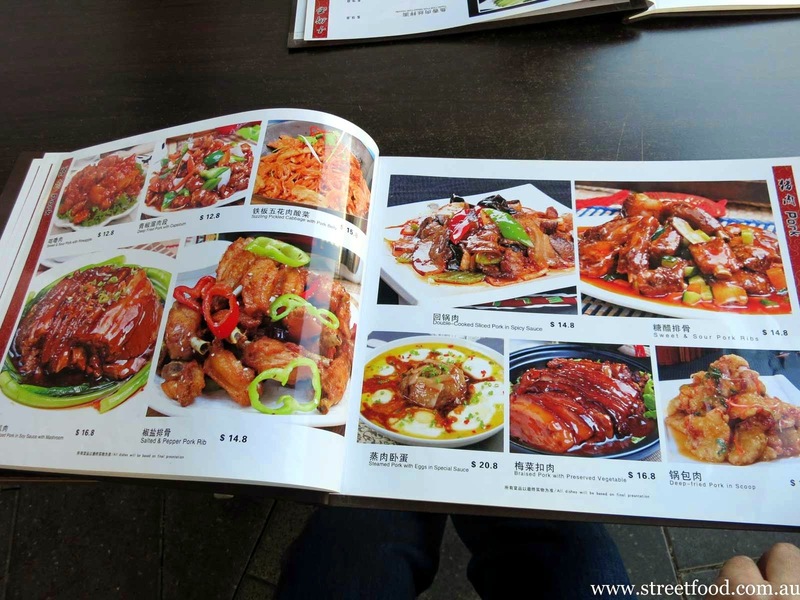 This menu has the best food pictures we've ever seen. 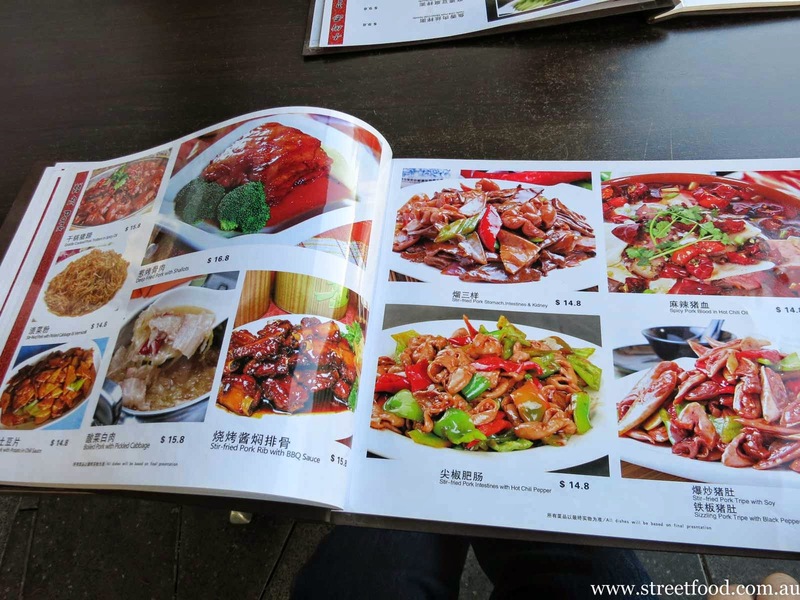 There's plenty of kidney, intestine and liver dishes for the offal lovers, a large selection of fish dishes (we might get back for the fish head and pancake dish) and a big array of vegetable dishes to offset the meatier options. The outside tables can get a little wind swept but are refreshing when the weather is warmer. 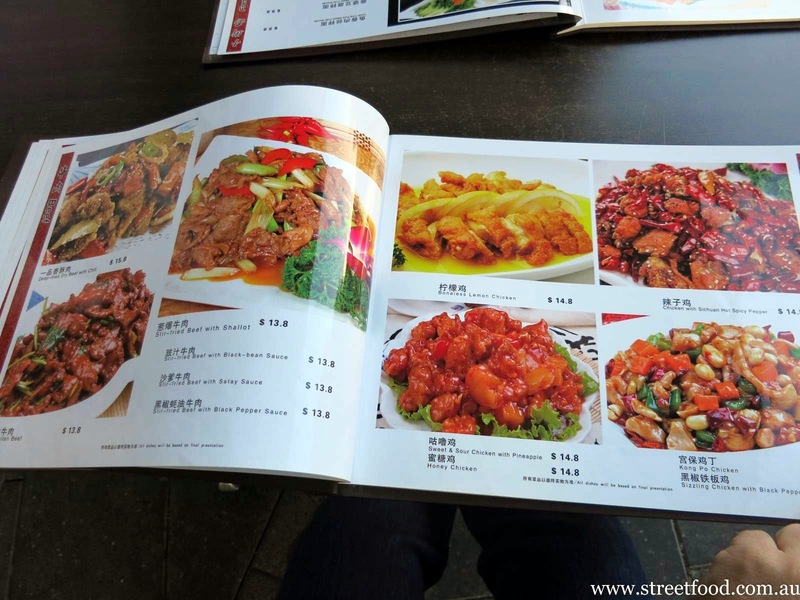 Northeastern Family Chinese Restaurant is at Shop 1, 7 Potter Street, Waterloo. Phone 9310 4788 (home delivery to Waterloo and Zetland). Hi FangyFood, looking forward to what you dig up out west too. We try and get out that way as much as possible. We love JongaJip in Eastwood, thanks for the suburb reminder. 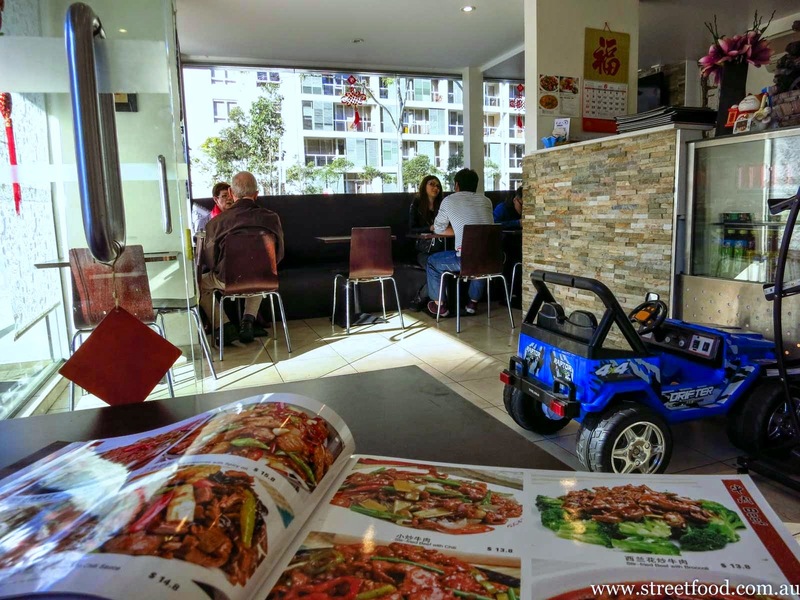 I would also suggest Hong Fu on Charles St in Parramatta. 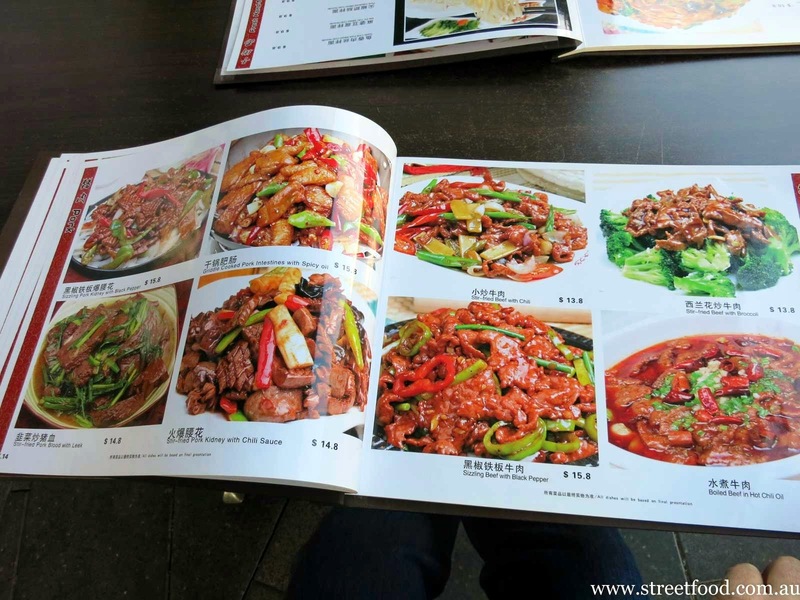 It is Northeastern Chinese, and their Toothpick Lamb hurts so good. That't's a great tip Plum, thanks. 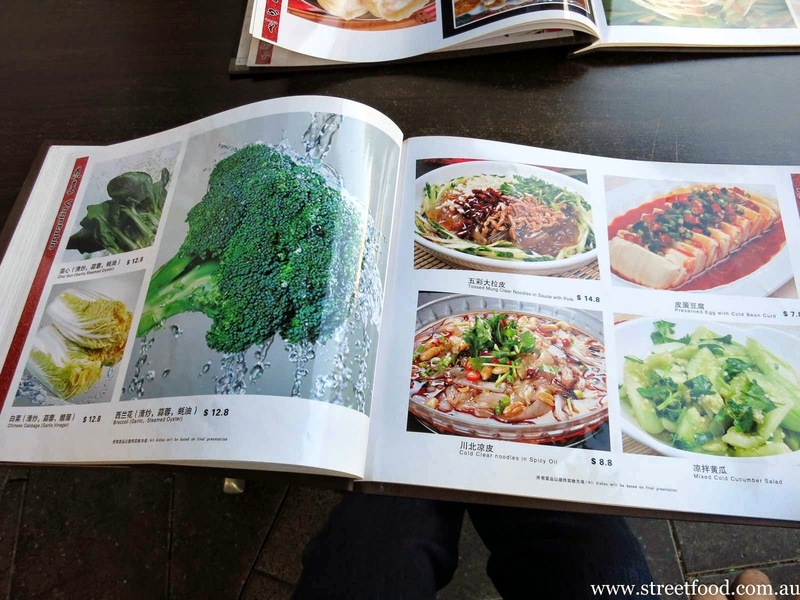 Such a quirky find, and lol at the broccoli!